Customer service will tell you everything you ever wanted to know about how to improve your products and services. This is the beauty of customer data—but more importantly how are you acting on that customer data? On-demand parking and valet services company Luxe Valet is an example of a cool new company that makes customer data a priority. They actually do something with it. They are also interesting because they are so committed to the customer experience they see the value in having more influence over their contract employees and the experience those employees deliver to customers. They’ve given their contractors full time status. This is a big deal in a time where many companies such as Uber and Lyft are still dealing with the courts over whether they have to give their contract employees the benefits that full time employees get. This week’s Modern Customer podcast guest is Eva Khoo Senior Director of Operations of Luxe Valet. 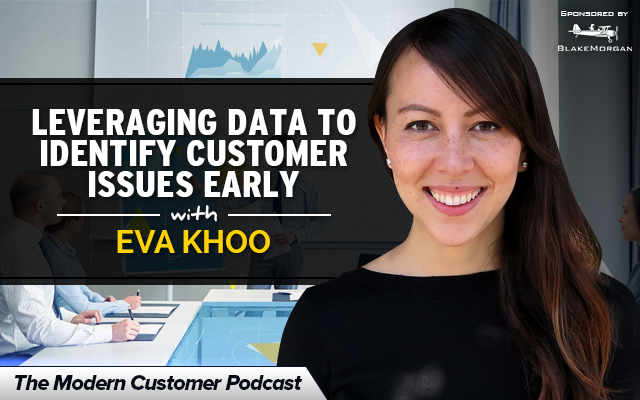 For Khoo it’s about being able to really train and focus on the customer experience. One of the ways Luxe Valet enhances this is a required valet shift, where everyone from corporate headquarters has to act as a valet themselves. Commuting is a big problem. According to the National Household Travel Survey, U.S. Department of Transportation, Bureau of Transportation Statistics almost 76% of commuters drive alone to work and 18 million of those commuters are driving from the suburb to the city. More than three million commuters drive almost an hour or more to work each way every day. That’s without looking for parking—and if you’ve ever driven into San Francisco (like I have) you know what a nightmare that is. Luxe Valet has partnered with parking lots all over cities like San Francisco, Philadelphia, Boston, Los Angeles, Seattle, Chicago, Austin and New York. It’s good for the customer and good for the flow of traffic. From a customer experience perspective Luxe’s story is compelling because of their detailed attention to the customer experience. As a result they have a very high customer loyalty rate with the average customer using their service twice a week. Luxe tracks customer issues and focuses on root causes to solve the feedback loop with customers. They use Salesforce’s Desk.com and have a continuous feedback loop with their internal product team. This means they are actually taking customer issues back to internal employees such as engineers to fix any problems. Many companies do not do this—it sets Luxe apart and drives their product quality. Luxe has a strong customer engagement strategy making it very easy for customers to get in touch with them. Customers within the Luxe app can call, text, tweet (or other social media) or email support. Podcast guest Khoo says Luxe wants engagement to be as absolutely easy as possible for customers. Data has brought to light recurring issues and opportunities for Luxe. For example sometimes they’ll release a product and they use data to uncover early issues with the product. They use this data to make the offering more fluid and intuitive. They use data to understand what drives customer service volumes. So many companies skip the step of looking at high volumes on specific FAQs and asking themselves what they could proactively do to make that volume go down. Luxe also uses data for ideation. For example Luxe noticed customers wanted to leave their cars in the city overnight because they wanted to do things like go to happy hour on a Thursday and take the train home (especially if they’d been drinking). Luxe figured that out and as a result came up with a service that drives the car all the way home for the customer—so the customer can enjoy a a cocktail out with friends and get home safely (Luxe also donates money regularly to Mothers Against Drunk Driving – MADD). If you’ve read my previous columns you know I believe customer experience in the sharing economy as a whole can be challenging. Customer experience is incredibly varied with companies like Uber, Airbnb or Instacart. According to Khoo customer experience is especially challenging in the world of the sharing economy—but more specifically on-demand services–because you’re dealing with issues in real-time and you’re “held to the same standards as everyone else.” Also your window of customer engagement has shrunk. Luxe doesn’t look at customers as “just transactions.” According to Khoo they are in it for the long haul and empower their team to make every customer experience a delightful one. Now they offer car washing and gas refueling and Khoo believes there is a lot of potential in the future to expand in the on-demand space. At the end of the day Luxe Valet can impact urban planning—parking lots take up valuable real estate. Khoo is inspired by Jack Welch who says that winning is the company’s social responsibility. Winning and making the company successful is Khoo’s goal for Luxe. Eva Khoo is the Senior Director of Operations for Luxe, an on-demand parking and valet services app headquartered in San Francisco. In her role, Eva manages the company’s nationwide operations, overseeing live ops, logistics and customer support. Prior to Luxe, Eva was an investment banker at Goldman Sachs where she advised companies within the firm’s Technology, Media, and Telecom practice. Her primary responsibilities included the execution of M&A and financing transactions for software and networking companies. She also worked at Peninsula Capital Management, an investment fund headquartered in San Francisco. Eva holds an MBA from The Wharton School at The University of Pennsylvania and a BA from University of California, Berkeley. Follow her on Twitter at @EvaKhoo. Check out the Luxe app here.